Lapping paste for general use (steel, etc. ), available in various grades, strengths and syringe size. Colour coded for ease of identification. Available in 5, 10 and 20g vials. Oil and grinding pastes have contrary functions, while abrasive increases the rubbing and cutting the oil seeks to reduce it. However oil is used to control the abrasive and cutting action. It also is the base in which the abrasive particles float and move under the action of the mating surfaces. Oil or grease is however used in a certain measured amount. Some people like to use additional lubricant during the process. However it must be remembered that the addition of more oil is reducing the effort and the cutting action of the abrasive particles. The abrasive particles are also washed away if extra lubricant is added. If you want fast removal of the metal you must lap until the effort to move the mating parts reduces. The reduction of the force indicates that the abrasives have broken down to harmless paste and are now acting like a lubricant. Therefore you must remove the old lapping paste and put fresh paste. If sufficient care is not taken during this time then metal to metal contact would take place and the effect of spot welding and scuffing would spoil the finish desired. Lapping is a skill and a technician should work down from a coarse to a very fine grade in a proper sequence to get the desired finish and precision as required. Each grade has carefully controlled similar sizes of abrasive particles suspended in the base. It is a good practice to keep all lapping paste syringes closed when not in use and before a fresh charge of lapping paste is applied the workpiece should be cleaned of any contaminants. This is very beneficial when you are doing fine lapping. Cleanliness is one of the most important factors in precision lapping, as is the quality of the lapping paste and the skill of the operator. Ensure the workpiece is cleaned with clean rags and blown dry with compressed air before lapping. If a lap is being used, then it should be cleaned with appropriate cleaner and then blown dry with compressed air. Also when removing used lapping paste from items being lapped, they should be wiped with soft tissue paper and cleaned with compressed air or washed through an appropriate wash system. 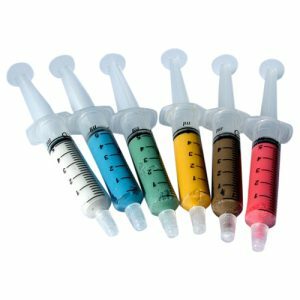 We offer a comprehensive range of lapping pastes in various grades, strengths and syringe sizes – see our online shop for pricing, etc. ← Pemamo installation – complete !